Chelsea are reportedly considering a £30m move for Stoke City goalkeeper Jack Butland, with ongoing doubts over Thibaut Courtois’ future. The 25-year-old shot-stopper is currently in Russia with England for the World Cup, and so it’s unlikely that a decision over his future will be made until after the tournament. Nevertheless, according to The Sun, Chelsea have been linked with a £30m move for Butland as he could be a possible replacement for Courtois, with Liverpool also specifically mentioned in the report as an interested party while The Express have previously linked them too. 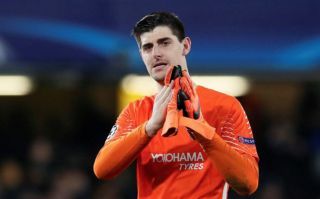 Should Courtois leave, it would be a major blow for the Blues as the Belgian international has been crucial to their success over the past four years and so it’s crucial they get his replacement right if necessary. Meanwhile, should Chelsea or Liverpool step up their interest in Butland and offer him the No.1 spot at either Stamford Bridge or Anfield, that could be a difficult offer to turn down. Butland made 36 appearances last season, keeping just six clean sheets while conceding a whopping 63 goals. That doesn’t reflect particularly well on him, but as noted, in a relegated Stoke side, it was always going to be difficult for him as the Potters struggled throughout the season to secure their top flight status. The 25-year-old has proven his quality on numerous occasions, and perhaps with a solid backline in front of him, he would prove to be even more impressive. While Chelsea may need a replacement for Courtois if he leaves, as suggested by the Sun, question marks were arguably raised over Loris Karius again last season after his horror show in the Champions League final with his two costly blunders. In turn, time will tell if that’s enough to force Jurgen Klopp into the transfer market for a player like Butland to potentially replace Karius in the starting line-up. According to The Mirror though, the German shot-stopper could get a reprieve and remain first choice at Liverpool.